RÉSONAANCES: Dark Matter is Back! A few weeks ago a paper claiming strong bounds on the local dark matter density made a news, hitting also particle physics blogs. Currently, the most solid evidence of dark matter comes from analyzing the Cosmic Microwave Background, and from the observed flatness of the galactic rotation curves. It is less known than in our galaxy the support for dark matter comes from studying the rotation curves at distances of 20 kpc or more from the galactic center. In the immediate neighborhood of the Sun (8 kpc from ground zero), the presence of dark matter is more difficult to deduce. 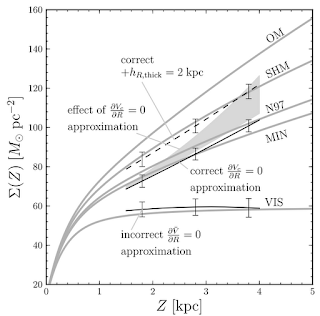 The value of the local dark matter typically quoted, ρ = 0.4 GeV/cm^3, is based on extrapolations using particular models of the dark matter halo. The recent paper by Moni Bidin et al. attempted a direct measurement of the local dark matter density. Studying the kinematics of a population of stars drifting a few kpc above the galactic plane, they were able to estimate the so-called surface density, that is the integral of the mass density in the vertical (wrt to the galactic plane) direction. If there is only the visible matter concentrated in the disc then the surface density should be constant above the disc. Conversely, if there is dark matter in the form of a spherical halo then the surface density should continue growing above the disc. The paper finds the data are well fit by a constant surface density for z > 1.5 kpc above the disc, setting the limit ρ < 0.04 GeV/cm^3, that is 10 times smaller than what is usually assumed. The authors went as far to saying that "our results may indicate that any direct DM detection experiment is doomed to fail". This is of course a sheer nonsense, even if their limits were true. The event rate in direct detection experiment depends, among other things, on the product of the local dark matter density ρ and the scattering cross section of dark matter on protons and neutrons σ. The latter has no obviously preferred value, and in concrete particle physics models it may span many orders of magnitude. Thus, the constraint on ρ doesn't tell us anything about the subjective chances of detecting dark matter; it only changes the interpretation of direct detection experiments in terms of the limits on σ. A smaller ρ would mean weaker limits on σ, thus weaker limits on the parameter space of dark matter models, which would actually make many of us happy. Nevertheless, the claim that there is no indication of the presence of dark matter in the solar neighborhood was somewhat disturbing to these experimentalists who spend entire lives in underground caverns, preparing and running dark matter detection experiments. Those can now utter a sigh of relief. A new paper by Bovy and Tremaine that has just appeared on arXiv says that the paper of Moni Bidin et al is "flawed". The strong limits on the dark matter density were obtained as a consequence of an observationally unsupported assumption about the velocities of the studied population of stars. As can be seen in the plot, correcting the wrong assumption leads to a perfect consistency between the data and the predictions assuming the presence of dark matter. pwned. Jester, if I may speak for the experimentalists that you mention, I don't think any of us was worried by an isolated paper, but instead quite amused by the Cassandras embracing a paradigm shift while ignoring decades of previous research. To what extent can we say that dark matter has now been observed in the motions of nearby stars, then? That's one way to interpret Bovy and Tremaine. Or is it just that this data remains consistent with the existence of nearby dark matter? i.e. is a null hypothesis *excluded* by Bovy and Tremaine? What do the recent LHC constraints on SUSY say about dark matter candidates? are neutralinos still a thing? Ru: there is no direct LHC constraints on neutralinos, so susy dark matter is and will remain alive. The parameter space may get tight in some constrained scenarios, but generally susy theory space is too vast to be completely killed. I think you'd do well to read both papers and make some comparisons. M-B clearly states that they are making an approximation when assuming a flat curvature and they also discuss at some length what the effects of a non-flat curvature actually are, whereas Bovy et al. mainly seems concerned about proving that the curvature cannot be exactly flat. But they never actually seem to ask the question M-B asks, what effect various curvatures has on DM models. If we trust in M-B then the curvatures Bovy et al. suggests would mean there is significantly more DM in the halo than is commonly estimated. Basically, Bovy et al. aren't even trying to debate the central issues of M-B. Stellar-Mass Ultracompacts like MACHO objects, neutron stars, GRB objects, microquasars, ... = billions and still counting. Still, if you like snipe hunts, "WIMPs" are a perfect quarry. "astrophysics sigmas, equivalent to half the LHC sigmas" - You are so frikkin' hilarious. But whose "mystery bumps" disappear regularly, and whose discoveries tend to stand the test of time and empirical evidence? Are there any indications that dark matter should be composed of particles? Not really, all we know is that it gravitates and that it interacts very weakly with baryonic matter. But I'm not aware of any good non-particle proposals. Some people talk about mini black holes, but afaik nobody demonstrated that this can quantitatively explain the CMB spectrum. Mike Hawkins has a preprint at arXiv.org that argues that primordial stellar-mass black holes are an excellent dark matter candidate, with considerable empirical evidence from various microlensing and quasar variability research efforts that would support that candidacy. But "WIMPs" are the only game in town - right? There are arguments against black holes as dark-matter candidates, but AFAIK none of them involve the CMB spectrum. A quick search of the literature reveals that Hawkins's arguments, while originally quite interesting, have since been ruled out by observation. Unfortunately, in his newer papers Hawkins ignores criticism of his work in refereed-journal literature. Regarding the decades of research, the perceived requirement for galactic dark matter was most convincingly established by studies of galaxy disk rotation in the 1970s that erroneously presumed the empirical laws of planetary motion should apply to spiral galaxies. As a result, it was expected that standard Keplerian rotation curves should represent rotational velocity as a function of the radial distances for objects within the disks of spiral galaxies, 'just like planets in the Solar system' (see Rubin, et al.). This is simply false, as galactic disk object strongly interact with each other. Phillip, I'm not an expert in this domain but my impression is that PBH papers do not discuss CMB at all. From CMB we know that the dark matter fluid must be very weakly interacting with the baryonic plasma, so that the anisotropies grow in the former and oscillate in the latter. Is it obvious that the black holes satisfy this constraint? Your first sentence is definitely true; at least, I've never seen one which has. I was thinking more of things like the Sunyaev-Zeldovich effect, which are caused by structures formed at later times. Your argument applies to earlier times. I'm not an expert in this area either. I suspect that your suspicion is true, i.e. PBHs would be too "clumpy" to produce the observed CMB, but a) I don't know and b) I don't recall ever seeing a discussion of this. Most arguments against PBHs are based on results from microlensing observations. So much work has been done on the CMB that I'm surprised I haven't heard of an analysis in this context, but of course that doesn't mean no-one has done one. I'm not ready to assume that Bovy and Tremaine are correct in their criticism until at least seeing what the original author M-B has to say in rebuttal, and I think we can safely assume that there will be a rebuttal. FYI - I posted a previous anonymous comment "Regarding decades of research..." Sorry for any confusion. BTW, I'm merely a retired information systems analyst, not a physicist.